And the winner is…Gage Hauck! Thanks for playing! And of course, adorable Easter eggs are everywhere. For those of us who like to try something a little different, Hide ‘em & Hatch ‘em is offering a unique new take on the Easter classic: eggs that hatch. The Games Fiends team received a package to try, and they are definitely a cute and candy free option that appeals to kids of all ages. The eggs themselves are roughly the size of a large egg, and even the shells themselves feel similar to a real egg, aside from their traditional Easter pastel colors. When the eggs are submerged in water, they slowly (very slowly) crack and then hatch – revealing an adorable new Easter friend for your child to enjoy. While the entire process can take up to a couple days to finish, my kids loved checking in on the eggs to see their progress – and a little friendly fighting over who got the bunny, chicks, etc. that emerged from the eggs. 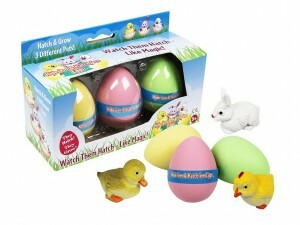 Thanks to our friends at Hide ‘em & Hatch ‘em, we have a package of Hide ‘em & Hatch ‘em Eggs to give away to one lucky winner. (Check them out here.) They’d make a cute addition to any Easter basket, and could even provide a fun little science project for families who want to go the extra mile. Enter in any or all of the ways below. Good luck! Give us a shoutout on twitter (be sure to mention @GamesFiends). Show our Facebook page some Easter love. Riddle me this in the comments below: If you were an Easter bunny, what color eggs would you lay?